Home » News » Help Us Keep California-Style Politics Out of Idaho! Stop the Far-Left Democrats. With the November elections less than three months away, we need you to help us protect our Idaho values. Democrats and well-funded out of state leftist groups want to bring California-style politics to our great state of Idaho, and we must stop them. Your contribution of $10, $25, $50 or even $100 is crucial to pushing back against those who want to change Idaho’s values for the worse. Idaho is home to many people who have fled states like California because of the mess liberal and left-wing policies have made. They come to Idaho for a better way of life, based on the Idaho values of fiscal responsibility, family, respect for individual and Constitutional rights, and more. But Idaho Democratic candidates – from the Governor to Legislature on down – are pushing the same destructive liberal, left-wing policies that rule in California and other Democrat-controlled states. Take the Democrats’ candidate for governor, Paulette Jordan, who spends much of her time out of state with far-left groups. New Jersey Sen. Cory Booker, a presidential hopeful, said there’s something “savagely wrong” with America. California Sen. Kamala Harris, another possible presidential contender, defended identity politics. New York congressional candidate Alexandria Ocasio-Cortez, also a Democratic Socialist, said voters don’t want moderate Democrats. The agenda of this event was all about government-run healthcare, bigger and more powerful government, higher taxes, open borders, and an attack on family values and 2nd Amendment rights. It’s straight out of the California playbook, and Paulette Jordan and many other Democratic candidates here in Idaho support it. It is clear that the base of the Democratic Party, including here in Idaho, has moved significantly to the left. These are not conservative or even moderate Democrats — under the misleading banner of “progressive,” they are embracing an extreme leftism that isn’t just out of step with Idaho values, it is openly hostile to them. 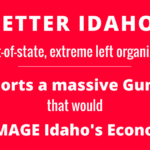 What’s more, out-of-state leftist groups, funded by billionaires and multimillionaires such as George Soros, Tom Steyer and Michael Bloomberg, are already active in Idaho. They’re working to defeat Republicans, elect leftist Democrats, and advance their destructive agenda. The only way we can beat these well-funded groups is with the financial support of Idahoans who believe in Idaho values. Your donation of $10, $25, $50 or $100 means we’ll have the resources to fight their California-style politics on the ground, throughout the state. By contributing to the Idaho Republican Party, you will help us mount an effective statewide campaign to defend Idaho values and elect candidates who respect those values. Please give today to help win this fight. We don’t want to look back and think we could have done more. The time to defend and protect our Idaho values is now. Thank you, and together we will Keep Idaho Great! August 15, 2018 / In Elections, News / By Idaho GOP / Comments Off on Help Us Keep California-Style Politics Out of Idaho! Stop the Far-Left Democrats.